The Uncanny Valley is a real scientific hypothesis about that odd feeling you get when you see something that looks human, but isn't quite right. The level of eeriness and revulsion is represented on this graph based on how well something imitates at person. 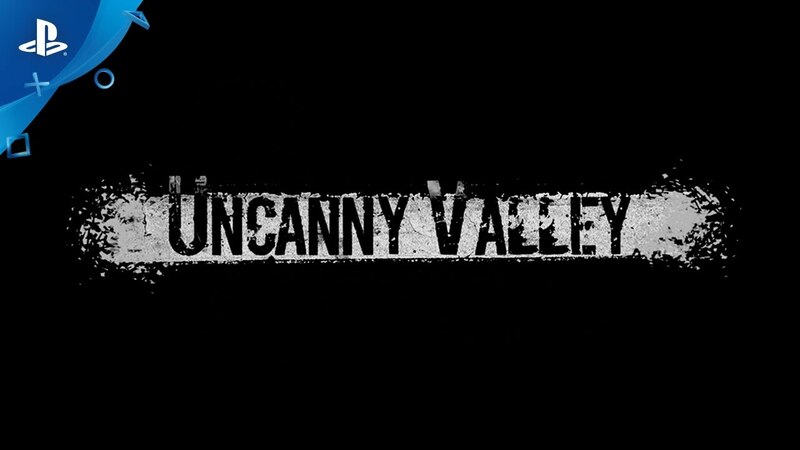 Uncanny Valley also happens to be the name of a new horror game on the PS4. 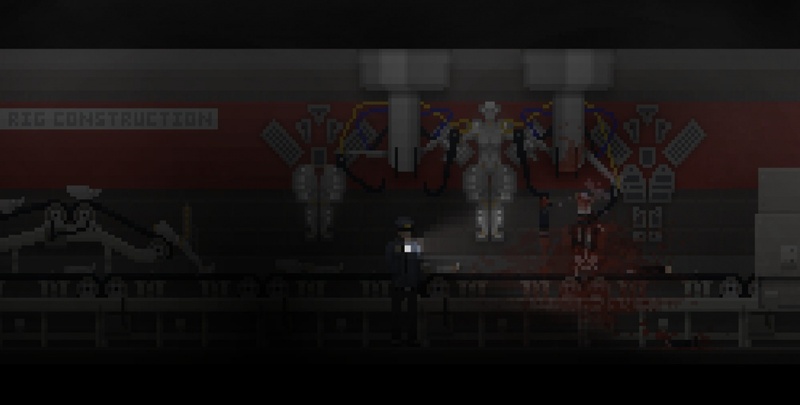 This pixel-art indie title places you in the shoes of a security guard named Tom who is tasked with patrolling a seemingly empty facility. Does this game nail that "uncanny" feeling, or does it fall into the depths of the valley? Time to find out! The story of Uncanny Valley is told a few different ways, and across multiple playthroughs. When you start the game, it will remind you of this, encouraging more than a few runs through the game if you want to see it all. You play as Tom. He's the new security guard for a company called Melior. You're joined by Buck, a grouchy colleague who trades places with you between shifts. Your job is to patrol the empty Melior facility until new owners purchase the property. Seems pretty simple. The only other character you'll encounter is a cleaning lady at the local apartment building where you live named Eve. Tom himself has a pretty intense backstory that's told through nightmares. You experience these between shifts when you're sleeping and they can be some of the most tense encounters in the game. Failing the nightmares doesn't cost you too much, but you may miss some backstory. Failing in the game, however, can be more detrimental. The game's story is indeed interesting, but its execution is a double-edged sword. On the one hand, it's awesome to have a game with multiple playthroughs and endings like this. On the other hand, repeating the same first half or so over and over gets old. What makes the issue worse, is the fact that there's not a lot of guidance as to how you should or could get different endings. Some options are obvious, but others require you to perform very specific actions at specific times. This is because of the game's double-sided design. The first half of the game has you working shifts that last 7-minutes in real time. Beyond these shifts, you don't have much time to explore before you collapse from exhaustion. Whether by choice, accident, or simply running out the clock, you'll eventually transition to a more traditional horror experience. Here, time is not an issue, but you can quickly find yourself with a bad ending if you're not careful. It's a bit jarring to go from a timed experience, to a calculated one. This is also where the game can become frustrating for those who want to see the whole story. There's a unique consequence system in place that punishes you for things like getting your arms or legs hurt. For example, if your arm is broken, you can't use your gun or weapons. If your legs are injured, you can't crouch, and so on. When you take too much damage, instead of getting a game over, the consequence system takes you to another part of the story. This is cool, but it can also lead to you missing entire sections of narrative because you were trying to figure out a puzzle or hide from an enemy. In other cases, you may end up seeing events or characters that you haven't met, or perhaps only met them in another playthrough. This is where I'm conflicted with Uncanny Valley's story. It's a good narrative when all is said and done, and I really like the idea of multiple playthroughs for the whole story. Plenty of other games have done it and it works well. The issue here, is that more often than not you'll end up with an ending that adds nothing to the core storyline. Worse still, you'll probably see those bad endings more than a few times as you try to figure out what the game wants from you to get a better outcome. In the end, it's a good story, and a scary one as well, but it requires a lot more work to see it than you would expect. I don't want the game to hold my hand or explicitly point out choices and consequences, but without even a little help from the narrative or design side of things, failure is far more prevalent than success. I think what it really comes down to, is the lack of an "ah-hah!" moment. Uncanny Valley's endings piece together the puzzle, but I wouldn't say any of them are a "true" ending. This leaves out a sense of completion and instead just asks you to either keep trying until you've seen everything, or walk away with what you found. I think it would have been better if the game's endings were all leading you towards something, which is what many of these game types do. Instead, Uncanny Valley never offers that moment where you feel like you've solved the mystery. That happens outside the game's narrative. The gameplay in Uncanny Valley reinforces an older style of play. The 2D movement is only controllable with the D-pad, which is honestly preferable, but it is also combined with point and click mechanics for item usage and a separate button to pick up and interact with items. None of this is a necessarily a bad thing, but I would often get confused between whether the game wanted me to pick something up (R1), or interact with it, (X). This is just the beginning of the game's confusing nature. The puzzles in Uncanny Valley are never cut and dry. Some of them, like finding a safe password and a key, are fairly easy to sort out, but others like purposefully getting hit so you can use an item, aren't as simple to see. There's nothing wrong with difficult puzzles, but without any guidance, I don't know how people are expected to figure some of these out. For example, why would I think to bash down someone's apartment door with a fire extinguisher? Other than that, the controls are responsive. It is worth noting that your sprint isn't very long to keep the game balanced, so expect to get winded. Also, the gun mechanic can be very awkward. One button readies the gun, another fires, and another reloads. Reloading seemed to dispose of the ammo I had in there, so I wouldn't reload unless you have to. At the end of it all, Uncanny Valley seems to encourage player freedom by letting them explore and experiment to their heart's content. However, in doing so, it also freely leads them down familiar paths and into bad endings time and time again. There's something to be said about guidance and balance in a game like this, and I think in this case, a little more guidance could have gone a long way towards helping some of the puzzles and mechanics feel more cohesive. The in-game dialogue is text, and because of constraints in the resolution and graphic style, it can sometimes cut sentences in half as they can't fit entirely into a single box. It can be a little confusing, and the font makes certain letters hard to discern, but I was able to get used to it fairly quickly. Beyond this, the pixel-art style is very detailed and made for some excellent encounters with rather terrifying enemies. The horror moments in Tom's nightmares were especially intense for me and one of my favorite aspects of the game. The other enemies you face are also relentless and will indeed break through doors in their pursuit of you. The sparse voice-acting comes from collectible tapes you find and has an appropriate level of distortion to it for the means that you're playing them on. A final standout aspect of the presentation is the sound. The game's soundtrack is subtle, yet incredibly unnerving. I felt incredibly unsettled playing Uncanny Valley and I attribute a large part of that to the incredibly well done soundtrack that meanders between dismal and depressing sounds, to the harsh effects of the industrial setting. At around 2 hours or so for a longer playthrough and better ending, Uncanny Valley is a mixed bag. I love parts of it, and other parts I really find frustrating. Even with a walkthrough, you'll most likely slip up on your way to the ending you want. It's a game full of great ideas that don't quite fit together, but it's also a decidedly intense and unsettling experience. If you have the patience to see it through, you'll find that Uncanny Valley has a solid amount of horror to offer. Just be ready for a good amount of trial and error on your way to answers.